Fig. 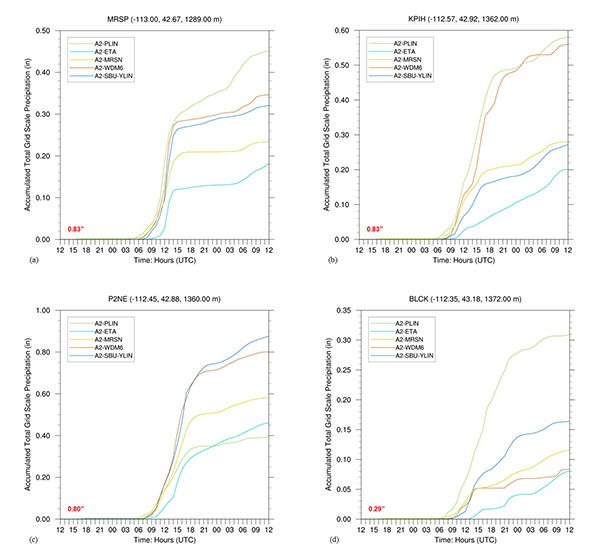 (8) WRF-UEMS Run A2 accumulated total grid scale precipitation (in) using PLIN (solid green line), ETA (solid aqua line), MRSN (solid yellow line), WDM6 (solid brown line), and SBU-YLIN (solid blue line) schemes at (a) MRSP, (b) KPIH, (c) P2NE, and (d) BLCK. The 24-hour observed SWE (bold red text: in) from Table 1 is indicated in the lower left of the figures. The longitude (decimal degrees), latitude (decimal degrees), and station elevation (m MSL) are indicated at the top of the figures. The model run cycle is 48-hours from 1200 UTC 25 December 2003 to 1200 UTC 27 December 2003.